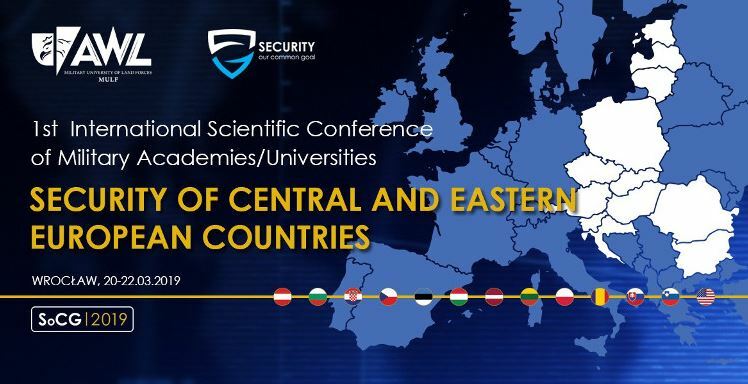 Commandant of the Baltic Defence College (BALTDEFCOL) Major General Andis Dilāns accompanied by Dean and Director of the Department of Military Studies participated in the 1st International Scientific Conference of Military Academies/Universities “Security of Central and Eastern European Countries”. The Conference was organised by the Polish Military University of Land Forces (MULF) in Wroclaw between 20th-22nd of March 2019. The opening speech was provided by the Rector-Commandant of MULF Brigadier General Dariusz Skorupka followed by a keynote speech by Professor Przemyslaw Zurawski vel Grajewski related to the historical perspective of military dimensions of the European integration. During the Conference, MG Dilāns delivered a speech “Security of the Baltic Region and Beyond” covering the broader aspects of security challenges and dilemmas linked with the security in the Baltic region. In his speech, MG Dilāns highlighted the importance of cohesion and cooperation among NATO nations. The Conference offered an opportunity to meet the leadership of other Professional Military Education (PME) institutions to discuss and coordinate common projects and academic events. MULF is a partner of BALTDEFCOL and both PME organisations are sharing their knowledge and experiences related to education and research. The Conference as an academic forum for discussion of security matters and their role within PME is to be continued annually.